Are you interested in a deadlift workout plan for beginners? Have you thought about starting a deadlifting workout routine? I was possibly in the same boat as you. Overweight, lethargic and giving up on life after hitting the ripe old age of fifty five. If you feel like you are in a place that is hopeless, that you can never get into shape, that you cannot lose weight, that you cannot look alot better than you do now, well, think again. A progressive deadlift workout plan together with a sane diet plan can work miracles for your body and mind. When your friends and family see you after six months of consistently eating right and a consistent strength training plan, they themselves will say that it is a miracle. Think of it, your body is always striving towards a better life without you even being aware of it. You are not directing your heart to beat or your digestive system to function. They work whether or not you are thinking about it. If you give your body the space to do it's thing, you can transform your mental and physical physique in the span of six months. I know it because I have experienced it. The deadlift workout plan was fundamental to the physical transformations that I have witnessed. 1. You must start to get a good night sleep. Huh? You think that has nothing to do with a successful deadlift workout plan? Great sleep is basic to building muscle and repairing your body. Remember how we do nothing to control the most important functions of our body? Remember how our body makes sure to breathe whether or not we think about it? The body also needs to rest and repair and if you give your body the chance to rest and repair, your deadlift workouts will show results on your physique. Sleep is critical for life whether you are working out or not, but especially when you are trying to build muscle and burn fat, you must rest. Stop watching tv after ten pm and make sure that you push yourself to get a good night rest. With good sleep, you will have the strength to start doing your deadlifting workouts, even early in the morning. I know it is popular for bodybuilders to eat six or more times a day. This deadlift workout plan is for beginners, not for bodybuilders. This deadlift plan is for men who have been struggling to lose weight for too long and who have probably never even thought that they can get stronger as well, even after the age of 50. 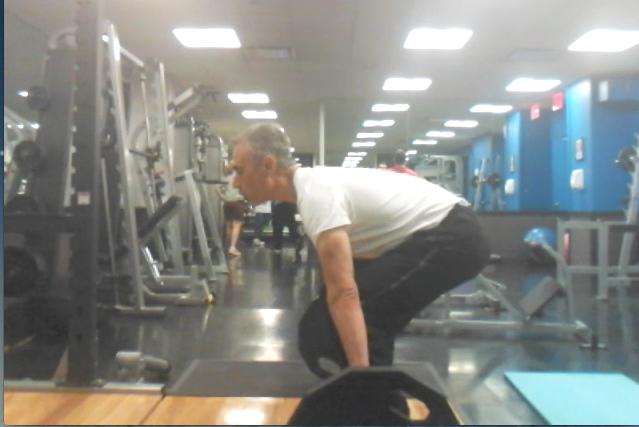 Sure, a deadlift routine is great for men and women of any age, but I am particularly interested in helping people who have given up the hope of ever getting into better shape again and resign themselves to chowing down doritos while watching the tube. Not that there is anything wrong with that, but if you are doing that because you have given up the hope of getting into shape, you are selling yourself short. As long as you are still breathing, why not live the best quality life that you can? This deadlift plan will help you to lose weight and get healthier. Three meals a day is the next rule in this deadlift workout plan for beginners. What does three meals a day have to do with deadlifting you ask? If you do not get your eating under control, forget about deadlifting. If you do not get your eating under control, forget about fitting into your 32 inch waist jeans that you have not worn since high school. If you do not get your eating under control, you are facing worse problems than not being able to deadlift, obesity is an epidemic and is linked to the most feared diseases that we face as men over the age of fifty. Whether we like it or not, any man over the age of fifty must get down to his ideal body weight and ideal body fat percentage. Getting your weight and fat percentage under control is not just about looking good, it is about being healthier, getting as healthy as you can, for yourself and for your family and friends, the people who care about you in your life. Hopefully, you care the most about yourself, so you will take the actions necessary to start getting healthy today and stay on this path one day at a time. I am going to give you the simplest diet plan for men possible. In the morning, start by having a tall glass of water with lemon, or even two. Breakfast does not mean donuts or muffins or bagels. Breakfast means a good source of carbs, a good source of fats and a good source of protein with lots of vegetables on the side. Your liver can only process so much food at one time. After your breakfast, you must take a break from eating so that your body can do it's magic by digesting your meal and turning it into your blood and bringing nutrients to your entire body. If you keep eating all day, your body has no time to rest and repair. You also will feel sluggish when you do a deadlift workout or any other workout. If you feel strong enough in the morning, you can do your deadlift workout plan before breakfast if you have enough time before work. If not, then have your breakfast and schedule your deadlift workout before lunch or dinner so that after your squats and deadlifts, you will then eat your next meal. Three meals a day is going to help you stop overeating, stop over snacking, stop you from mindless meals made up out of non foods like snicker bars and oreo cookies. Eat three nourishing meals a day, made up out of the three major food groups and make sure that you have a nice addition of salad and/or vegetables with your meal. You can have one food each from each group for a meal, so if you are having a multi grain turkey sandwich at a restaurant for lunch, you will not order french fries or mashed potatoes on the side, because that will be two carbs not to mention that the fries are fried and no good for anyone who is trying to look their best. Instead of having two carbs, have an additional salad, add some avocado and voila, you have a lunch that will keep you going. The time in between each one of your three meals should be about four to five hours. It is time to get off of the wagon of endless eating. There is more to do in the world than eat, so stop eating all day, have three nourishing meals and spend the rest of the day building the best health possible. Included in this section of deadlift workout plan rules is that you need to drink water. Dehydration is bad, so make sure that you drink sufficient water throughout the day. If you have breakfast at 9 am and start to feel hungry at 12pm, drink more water, do not go out for a snack or a nutrition bar. If water does not do it for you, then have your next meal, but you should have had at least a four hour break since your first meal. Dinner should be over with three or four hours to spare before going to sleep, so if you finish dinner at six, perfect timing for going to sleep at ten. Believe it or not, Ben Franklin himself said to finish dinner at six and go to sleep at ten. If you are consistent with eating three meals a day, with good quality food and vegetables and fruit, and are not stuffing yourself all day, you will see your weight start to drop, some days precipitiously, boom, sometimes as much as one or two pounds a day, especially if you are very overweight. By the way, whether you are very overweight or not, make sure to get your doctor's approval to exercise. And, if you are overweight, you might need to lose a sufficient enough of pounds before you can physically do squats and deadlifts. When I was 275lbs, I could barely walk, let alone squat or deadlift, I could not even see my feet past my belly, so I get it, you cannot imagine that one day you will be doing squats and deadlifts and have a 32 inch waist. I promise that you will if you consistently stick to the plan. It is not normal to be a hundred pounds overweight. Stop fantasizing about ‘food' like doritos which are not food, sorry doritos, no matter how slick your packaging is, we know that you are not a food built by nature. Start thinking of food as fuel for your life and as your friend that will enable your body to do it's magic of building a new you. You thought you would get away with just deadlifts? True, you can start a deadlift workout plan without doing squats, but I believe that squats are a great warm up for the deadlift. Do your squat workout first and then your deadlift workout. A squat workout is not easy. Squats and deadlifts are not easy. Start your squats with no weight. Build up gradually as you will do with the deadlift and any other resistance training exercise. You cannot just workout your lower body, so make sure to start a pushup workout plan along with your squat and deadlift workout. You can start with one pushup on your squat and deadlift workout day and increase from there. Every deadlift workout, add a pushup until you get up to a hundred pushups. By that time, you will be in great shape! Squats and deadlifts must be respected because despite their potential for amazing results, they also carry risk. If you do not perfect your form for the squat, deadlift or any other strength training exercise, you are putting yourself in a vulnerable position of possible injury. Every exercise demands proper form. Every position in life demands proper form. Deadlifts and squats are no different. You must learn proper squat form and proper deadlift form. Read about proper squat form here and deadlift form here once you have finished reading this article in it's entirety so that you have the complete picture of how to structure your deadlift workout. This deadlift workout is not about walking into the gym cold and throwing alot of weight around to look cool. You want to get lean and strong. You want more ability and strength to spend time with your family and friends. You have to know that even though you might already be over the age of fifty, you can get into great shape. You might not believe it, but it is true. 1. Get to sleep and let your body rest. 2. Three meals a day of real food daily which you can read more about over here. 3. Besides deadlifts, add at least squats and pushups to the mix. Yes, there are so many exercises out there that you can do, but you have to start somewhere and deadlifts, squats, pushups and walking are the bare minimum. With just those exercises, you can lose fifty, sixty, seventy five or even a hundred pounds. I know, because I experienced a seventy five pound loss. The only changes that I made were actually quite simple and are all spelled out here. 4. Always work on using the best form possible to get the most out of your exercise and protect yourself from injury. 5. Gradual improvement will be your best friend if you are consistent. The plan that you stick to consistently is going to be the best program to lose weight, get stronger and healthier. You did not find yourself at a fifty inch waist or overweight overnight. Getting out of shape happened gradually over the years and all you have to do is to make gradual improvements starting today. Gradual improvement means adding resistance weight slowly. Don't start doing squats with a 45 lb barbell and then the next workout add twenty pounds to the bar. Gradual improvement means adding five pounds or 2.5 pounds for your next workout once you are comfortable at the current weight that you are lifting. Proven does not mean that you will win or even compete in a body building contest. Proven means that sticking to the Hashi Mashi Diet Plan for men of which the deadlift workout is a fundamental component, will result in losing weight and getting fitter. The most important goal is health and studies show that a man should have a waist size no more than half of his height, so if you are six feet, 72 inches, your waist should not be larger than 36 inches. A waist size over 40 inches for a man spells trouble. The goal of the Hashi Mashi Diet is to help you get your waist size down to a healthy number. When your waist size gets down to 32 inches, you will have lost the weight that you need to lose and you will be fitter and stronger. Weight is the most accessible metric that you can control. You can control how much, how often and the quality of food that you eat. The truth is that even if you did not do any exercise at all, but you improved the quality of your food and were consistent with the three meal a day regimen, you are going to drop the excess pounds that are attacking your system. You might think that the spare tire that you are carrying around your middle is just hanging out and doing nothing, but in fact, the layer of visceral fat that is covering over the stomach is dangerous to your health, very dangerous. 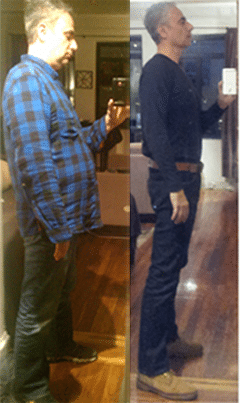 If you had asked me if I thought that it was possible to reduce waist size from 50 inches to 32 inches, I would have said it is absolutely impossible. Once you get used to eating certain types of food over a lifetime, it is not so easy to change. However, if you do change, if you do focus on eating real food daily, you can effectively eat yourself slim. You can eat your way down from a 50 inch waist or more and finally get to a place where you not only look great, but your health will be much improved as well. Don't make the mistake of thinking that six months is too long and that you have to be able to lose thirty pounds in thirty days. Haven't you already tried out those diet plans to lose weight fast? Hashi Mashi is a lifestyle. You must change your lifestyle going forward. Your body has remarkable capacities to improve and regenerate, but you have to give your body rest from the junk food you have been consuming for the last fifty years or more. At this point, let's get started. Do a deadlift workout three times a week. You only need to perform one set of 5 repetitions of your work set weight. Do your deadlift workout after a squat workout. You can choose any 3 days a week, with one day off in between each deadlift workout day for recovery. This workout should take anywhere between 30 to 45 minutes. If you miss a day or two or a whole week, no big deal, just pick up where you left off the following week. Warm up with a 45 pound barbell. Any olympic sized barbell in your gym or home without any added weights is 45 pounds. Read and use the proper squat form which is detailed here and here. First do 2 sets of 5 repetitions using the barbell only. If this is your first time, do another 3 sets of 5 reps and you are done with squats for the day. If this is not your first time, if you feel strong enough and doing proper form squats, then after your warm up, add 2.5 pounds or 5 pounds max to your squat workset and do 5 sets of 5 repetitions with your new personal record. Do not pay attention to how much weight you are using, pay attention to your form and how much rest time in between sets. I think that you will find at the beginning that a minute to 3 minutes is enough rest time between sets. Once you start squatting with heavier weights, you will need more time, even 5 minutes between each set of your work set. Let's say you are now squatting 120 pounds for your work set. If you start today squatting a 45 pound bar, you can expect to be squatting approximately 12o pounds in 6 to 8 weeks if you are consistent in your workouts. If this is the first time you are using a new high weight, start off with 3 sets of 5 repetitions and build up to 5 sets of 5 repetitions until you field comfortable at 120 pounds. Then move up to the next weight of either 122.5 pounds or 125 pounds. Gradually increase weight by using fractional plates. This example of a 120lb squat workout is a template for all future squat workouts as your squat weight increases. As you begin to squat higher weights with good form, you will notice that you are feeling stronger. That is not a mistake, your body is getting stronger by definition in order to be able to squat heavier weights. After your squat workout, which should be done in a power rack with spotting bars for your safety, then you can do some upper body workout sets before your deadlift workout. Do a few sets of overhead presses followed by curls to warm up your upper body. Then move onto your deadlift workout. You can start your deadlift workout using 50 pounds, just the barbell and 5 pound plates on each side or any weight above that where you feel comfortable. The deadlift workout only requires one set of five repetitions of your work set weight. You should already be warmed up by your squat , overhead press and curl workout. You do not need to do overhead presses and curls in between your squats and deadlifts. You can go straight to your deadlift workout, especially if you are pressed for time. However it is a good idea to do some upper body workout in between your squats and deadlifts. Read about proper deadlift workout form here and here. Read about the incredible benefits of deadlifts here. 1 set of 5 deadlifts using your current high weight. Respect the power and the risk of both squats and deadlifts, get stronger and prevent injury. You can finish off your workout with one to five sets of pullups, dips, kettlebell swings and pushups. Make sure to get in a 30 min or hour walk, drink enough water, get to sleep early and have 3 real food meals during the day. Rinse and repeat until you have reached your ideal body weight and body fat percentage. Please share your experiences and success with this deadlift workout plan for beginners and beyond. Celebrate the magical powers of your body to lose weight and get fit fast by following the simplest diet plan for men over 50 – Hashi Mashi.